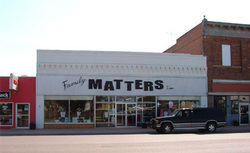 Family Matters, Inc. is a complete family clothing store. Featuring brands such as Lee, Levi, Lucky, Carhartt, Skechers, Keren Hart, Hanes and more. This is a community owned store and has been a model for many small communities across Montana. Directions: Located in downtown Malta.